Title: Name one or more scenarios that require caution. The title announces the possible danger and your intention of helping readers avoid the danger. Titles like: “No More Potato Chips – Beware of Salty Snacks to Stay Healthy” or “Beware of Credit Card Fraud – Protect Your Identity” are going to draw the readers in and provide a little promise for the content that’s inside. Introduction: Explain why proceeding with caution is important in your niche and the consequences of not doing so. Connect to the reader by illustrating a scenario that could happen to them and the events that would follow. Body: This is the meat of your article. The seriousness of the potential obstacle you’re describing will determine how you present this information. Beware Item: Describe what you think your readers need to be aware of, or a scenario that requires caution. It may be something you’ve actually experienced yourself or maybe not. The key is that the scenario could happen. What to Do About the Beware Item: You’re the expert, so share the steps of caution you would take or specific things you can do to avoid the problem. If you have personal experiences that are worth sharing, this would be the time to share them. Also, be honest about the possibilities of facing the scenario. Additional Items: Describe other similar situations the reader may face and how to deal with them. Conclusion: Recap what your audience needs to be aware of and why it’s important to take precautionary steps. The audience needs to know the reason why they should be aware there may be danger ahead. Word of Caution: This article template should never be used to put down your competitor’s product and promote your own in it’s place. For example, imagine you own Derek’s Flower Shop. Don’t write an article titled “Beware of Danielle’s Flower Shop” that lists reasons why your competitor’s shop is not good with a Resource Box that recommends Derek’s Flower Shop as the best option. That strategy is unethical, lazy and won’t help you build a reputation for quality content. Instead, your “Beware of X” article should be used to help your audience with real problems that they may face. For example, you might write an article titled “Beware of the First Frost” and describe the steps your readers can take to saving their plants from frost. 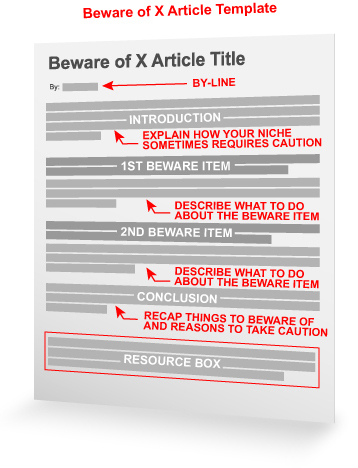 Use this template today to write your next set of high-quality, original articles to raise awareness of dangers in your niche. Then come back here and leave a comment to let us know how it worked for you. FEAR is a strong motivator of the human psyche. Everyone else uses it; so I guess you are right it does work; FEAR ME! That might make a great article title too? ha ha ha. Yes, well of course “Beware of X” is a great template to compel the reader. Great post here. People love to read these kinds of things. Nice improvement on your blog design too by the way. You should get A LOT more sign ups with this change. I have been using this for a while now but never had a drawn out template approach. This is awesome thank you! Excellent template and information. I will be sure to use it to inform my readers in my next article. Thanks a million for all of the great tips. great education on this post. Thanks for this latest template; in addition to encouraging more readers, this makes it easier (and dare I say more “fun”) for the writer to create a good article. That’s my experience anyway! The readers are always on the lookout for articles that’ll help them get the information they are looking for..thats right! Thanks for the another great article.. Thanks for the templates, having just had my first article accepted and not sure where to go from here, these templates are fantastic for pointing the newbies in the right direction. Is there a time a totally negative article is warranted? Jeremy, perhaps within your niche a totally negative article may be warranted. Just be certain that if falls within the limits of our Editorial Guidelines.